Australian feral Management controls hares on airport runways and for clients that are carrying out large seedling plantings. Hares (Lepus europaeus occidentalis) are an introduced species into Australia and have spread throughout most grassland areas. In some locations they can cause damage to seedlings, orchards, horticultural crops and soil conservation areas. Hares look similar to rabbits but are a lot bigger and have black tipped ears. They prefer open farmland with longer grass (such as dairy country), plantations or similar cover and can live in quite wet conditions. Hares can travel up to four kilometres daily to feed. Control work should be carried out before planting seedlings or crops. 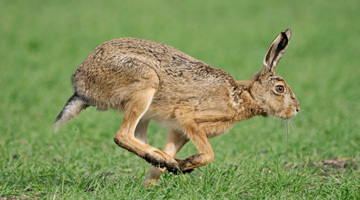 Hares do not generally take poison baits and shooting is often the most effective method of control.